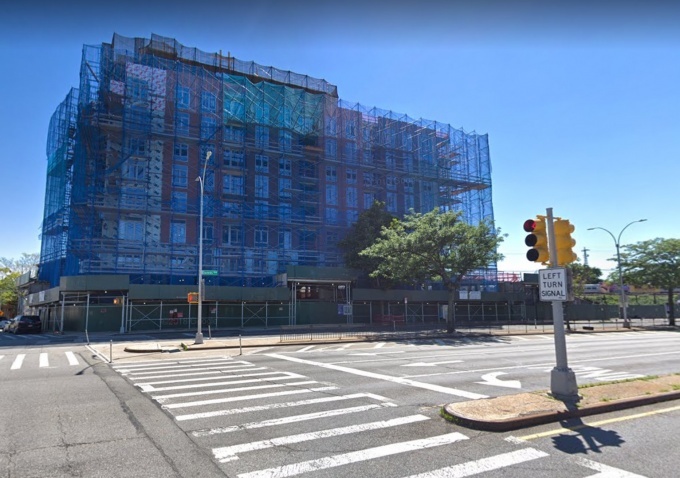 More than 20 apartments are up for grabs in a new affordable housing lottery for a soon-to-be completed development along Queens Boulevard in Woodside. J&J Tower, a nine-story project at 46-02 70th St., is offering 23 apartments ranging from studios and two bedrooms, starting at a monthly rent of $1,890 a month and going up to $2,530. The units are available to households earning 130 percent of the Area Median Income. Five studios are available to households of up to two people, with two available at $1,890 and three going for $1,920. The latter three studios require a household income between $65,829 and $95,030 for a single-person household to quality, and goes up to $108,550 for a family of two. Six one-bedroom units are also available for households of up to three people, and are split into two units at $2,150 a month and another four at $2,230 a month. A single person needs to earn between $73,715 and 95,030 to quality for the $2,150 unit, with the maximum going up to $122,070 for a three-person household. 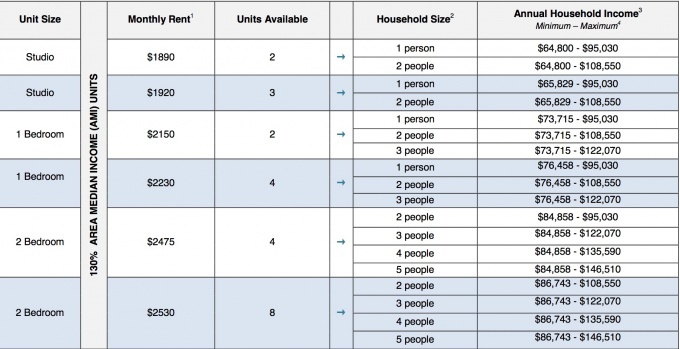 The minimum income to qualify for one of the $2,230 one-bedroom units is set at $76,458. The remaining 12 units in the lottery are two-bedroom apartments for household sizes of two to five people, and are also divided into monthly rents of $2,475 or $2,530. Four two-bedroom units are available for the monthly $2,475 price tag, and require a minimum income of $84,858 to qualify. A two-person household must earn no more than $95,030 to be considered, with the range boosting to $146,510 for a five-person household. The eight two-bedroom units require a minimum income of $86,743, and hit a maximum of $108,550 for a family of two and $146,510 for a five-person household. The application is open to all, with New York City residents receiving a general preference for the apartments. A preference for a percentage of the units goes to applicants with mobility and vision and hearing disabilities. To apply, visit NYC Housing Connect and follow the instructions on the lottery notice. Applications must be postmarked or submitted online no later than March 15. 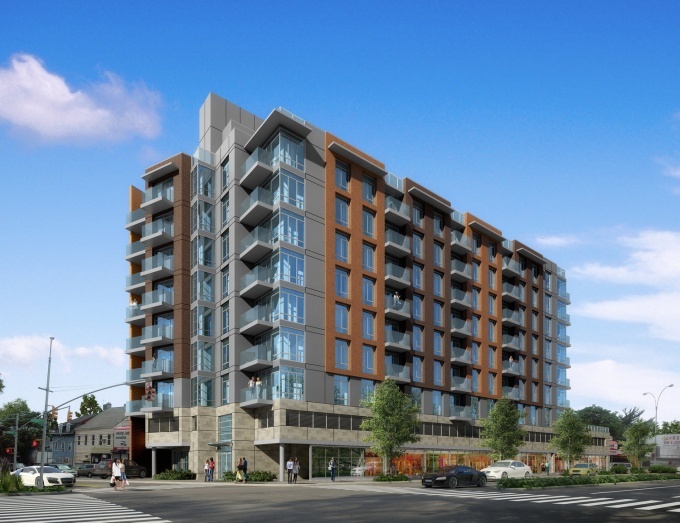 Work began on the 74-unit building, once the site of a auto shop, in 2015. This is not affordable at all! These are not hipsters moving in. This is Elmhurst moving west, not Amazon people. This is the ugly head called inflation showing itself. When the paper you use becomes worthless you’ll need more paper to get the same thing you got last time. No, it is called Gentrification or Colonization. When politicians are bought and paid for by big real estate and they sweep away the people they find pled into electing them so younger, more gullible people with way more money can move in and make landlords into the new oligarchs of the city. All Hail Prince Jimmy, Golden Boy of REBNY! the mayor is worse than Dinkins. and he was the most useless mayor in the history of NYC. in any case, the minimum income to qualify for one of the $2,230 one-bedroom units is set at $76,458. who in their right mind making that much would pay rent? Thank you! But honestly, you have a lot of hipster millennials making that type of salary all over NY. These are the snobs that are moving into our neighborhoods gentrifying them and setting up new living standards. I love how whenever these lotteries come up all of the definition hawks come in and gripe over what affordable means. As if the definition of affordable is whether they specifically can “afford” something. In context, affordable means substantially below market value. It doesn’t mean that every poor person can afford it. That just isn’t realistic. What a joke! This place is within walking distance of three homeless shelters, including the enormous one at the former Pan Am hotel. Regardless of that, it’s a really lousy area. Desolate at night and day. The subway is far away. Very little parking. It will probably end up becoming another shelter, because no one will want to live there. It seems like DeBlaz plans for the whole QB corridor in that area to become a giant homeless shelter. Not only that, there are mobile homes parked on the side streets, with homeless inside, just like we are seeing in Barnett Ave. Trumpvilles. Wow! How is this affordable? I know a single mom with two boys earning roughly $60,000 tying to get out of a difficult living situation in Ridgewood, Qns has been looking for almost 2 years for a new apartment. No one will even consider her application. We are in big trouble – homelessness will keep rising if this is allowed to continue. Well, that pretty much leaves out anyone who lives here already. I don’t know anyone making that much money. Just another instance of the never-ending cloud of baloney the government/real estate partnership has been pumping into the atmosphere around here since they came up with “Boulevard of Death” about 20 years ago as an excuse to start mucking around with traffic patterns that had served very well for 100 years. That was the beginning of the colonization. Long timers have been suffering dislocation in ever more severe degrees since then. You’ve gotten rid of most of us JVB, congratulations! Good job. This will all come back to haunt you some day. I’m a NYC municipal employee and have been applying to these “affordable housing” for 15 years. Not once have I gotten a call or response, yet my retired neighbor who earns no income, only pension won the Big 6 lottery! So in sum, this is all a big scam and there’s nothing “affordable” about it, anyway. $1,890 for a studio apartment? Hahahaha!!!!! The real face of the Democrats is showing more and more. How dare democrats offer discounted housing! They should build more luxury condos for the rich using illegal labor, and give the rich a massive tax break, the way Trump did! Trust fund baby complaining about the rich. A trust fund baby like…Trump? Surely you’d never support a trust fund baby like him? discount housing for who? obviously not the poor. i cant wait for the d’rats to tax the rich 90%. this city will be a ghost town with only the poor left.